AP EAMCET 2019 Admit Card has been released on 16 April 2019. APSCHE has declared that the AP EAMCET 2019 will be conducted from 20-22 April for Engineering and 24 April for Agriculture. AP EAMCET 2019 is Andhra Pradesh Engineering, Agricultural and Medical Common Entrance Test conducted by Jawahar Lal Nehru University, Kakinada on behalf of APSCHE, Hyderabad. Andhra Pradesh Engineering, Agricultural and Medical Entrance Test 2019 is a state level exam for admission into professional courses of Engineering, Agricultural and Pharmacy. Candidates need to qualify AP EAMCET 2019 in order to get admission into Private and Government colleges of courses offered by AP EAMCET. Candidates must fill the application form before the last date and also check the eligibility criteria before filling the application form. The total number of seats are offered under EAMCET is 153150. The candidates must note that admission in MBBS is granted through the NEET (UG) exam conducted by the National Testing Agency. 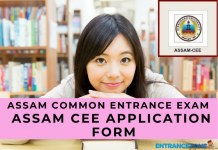 Through this article, candidates can get complete information about AP EAMCET 2019. AP EAMCET 2019 Admit Card has been released on 16 April 2019. Click here> Admit Card. AP EAMCET 2019 Application Form Correction has been started from 06 April 2019. Click here> Application Form Correction. NCC & CAP (Army Personal) Merit list is released by Jawaharlal Nehru Technological University Kakinada on behalf of APSCHE. The important details of Engineering, Agriculture and Medical Common Entrance Test (EAMCET) exams. The Andhra Pradesh EAMCET 2019 Important Dates are yet to be released by JNTU Kakinada on behalf of APSCHE. The candidates should stay in touch with the official website of the AP EAMCET 2019 in order to receive the latest updates regarding the examination. They can also get the updates from our website. The link to the official website is given below. Candidates ware able to download the admit card from the official website of AP EAMCET published by the conducting Authority. And, it has been available from 16 April 2019 onward. Candidates should verify the following details in their AP EAMCET Hall Ticket 2019. Further, candidates must carry the Hall Ticket ID along with them when they come to the Examination Centre. Moreover, applicants cannot enter the Examination Centre without the Admit Card. 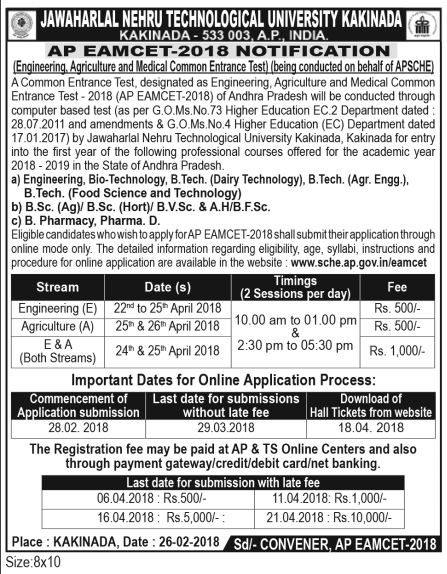 The application form for AP Engineering, Agriculture and Medical Common Entrance Test (EAMCET) details are mentioned below. 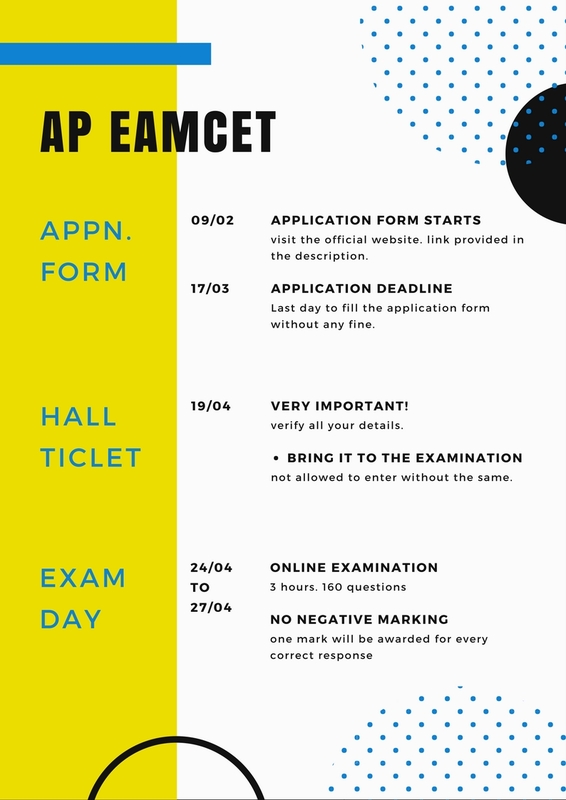 Application forms for the AP EAMCET are available from 26 February 2019 on the AP EAMCET 2019 official website. The application fee for Engineering Courses will be Rs 450. However, if the candidate wishes to apply for Both Engineering and Agricultural, he/she will have to pay Rs 900. Andhra Pradesh Engineering Entrance Exam Link to Apply. Given below are the steps to fill the application form for AP EAMCET 2019. Aspirants need to follow the given steps to fill the form without any mistakes. Candidates need to fill in all the details that are required in the filling of Application Forms such as Name, Address, Qualifications, Date of Birth and other important details. Candidates will then be required to upload Photo, Signature or thumb impression. In order to fill the application form of AP EAMCET, candidates will have to pay the application fee first (fee is mentioned in the table given below). After filling all the necessary details, candidates will have to click on the “Initiate Payment” button and the control will automatically take them to the bank payment gateway. The payment can be made using any bank debit or credit card, provided the card is a VISA or MASTERCARD or MAESTRO type. For payment of fee, candidates will have to provide all the mandatory details as asked, like qualifying examination hall ticket number, name of the candidate, date of birth, personal mobile number, alternate mobile number, email ID, stream and fees amount will be generated automatically based on the stream selected by the candidate. Note: Do not double click on buttons or click on Back / Refresh buttons or DO NOT close the Browser web page during the payment process. Maintain patience as prompted on the screen. Since any of the above conditions can lead to failure of Payment. Given below are the fee aspirants need to pay in order to be eligible to take the AP EAMCET 2019 exam. In order to appear in the AP EAMCET, Applicants should fulfil all the necessary requirements required for the examination. Applicant must be Indian National or PIO/OCI card holders. He/she should belong to the state of Andhra Pradesh/Telangana. Lower Age Limit: Applicant must have completed 16 years of age as on 31 December 2019. Upper Age Limit: There will be no upper age limit for the exam. Educational Qualifications Applicants must have successfully cleared 10+2 or equivalent in Science stream with at least 45% and 40% for candidates belonging to SC/ST category. The exam pattern for this year is given below, Although, the candidate can solve the earlier year papers to practice. Name of courses Name of Subject No. of questions. The AP EAMCET Syllabus is the essential requirement for an examination. However, preparing according to the right syllabus will help the candidates to qualify the exam with a good score. Further, Board of Intermediate Education, Telangana / Andhra Pradesh decides the syllabus for AP EAMCET. This combined entrance examination for engineering and medical courses will contain questions based on 11th and 12th level or equivalent examination conducted by the Government of Andhra Pradesh. It will consist of questions from subjects like Physics, Chemistry, Mathematics, Botany, and Zoology. Detailed Ap Eamcet Engineering Syllabus with weightage PDF is linked here. 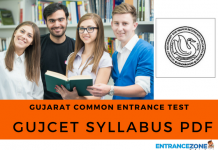 Also, Download APEAMCET 2018 Syllabus Agriculture and Medical Stream PDF Here. The answer key for AP EAMCET will be released by JNTU, Kakinada. The Student Response Sheet for AP EAMCET – 2019 for individual candidates will be available on Andhra Pradesh State Council of Higher Education (APSCHE) official website. The appearing candidates can check their Answer Sheets by filling their credentials like Registration Number & EAMCET Hall ticket No. The Option having green tick is key for that Question and Option given by the candidate represents as a chosen option in Response Sheet. The results of the Andhra Pradesh Engineering Entrance Exam 2019 will be declared in May 2019. And, the result will also include the weightage of Qualifying Examination (Class 12). Further, Andhra Pradesh Engineering, Agriculture, and Medical Common Entrance Test will display the results. And candidates can check their results and download a copy. Also, keeping a print copy of the result is mandatory for the candidates as it can be asked to produce during an event of the admission process. Candidates can download their rank card from the official website i.e apeamcet.nic.in/. It will be released in the second week of May 2019. Students may view AP EAMCET 2019 rank card by entering their registration number, hall ticket number & date of birth. After the declaration of the results in May 2019, JNTU, Kakinada will release the rank list of the qualified candidates. And, on the basis of this rank list, Applicants will be called for the counselling session. Conducting Authority prepares the merit list according to the Candidate’s score. Further, counselling will be held in the month of June 2019. Candidates will get admission according to seat availability and their preferences. The State Council of Higher Education will notify in June-July in newspapers, publishing the dates and ranks of the candidates. And the eligible candidates will be invited to attend the Registration, Verification process. Also, Schedule for Exercising options and a list of Help-line Centres will be mention in the notification. Whereas, Candidates who fail to report for Certificates verification will not be considered for allotment of seats in any of the colleges. Income Certificate issued by MRO issued on or after 01.01.2014 (in case the candidate – desires to claim fee exemption). Last Means: Including not qualified/ not appeared in AP EAMCET Minority candidates who have already applied to Convenor based on Intermediate Marks. A candidate can choose from many courses after succeeding in the AP EAMCET 2019 exam. The list of such courses is given below. AP EAMCET 2019 Exam Result will be released on 05 May. 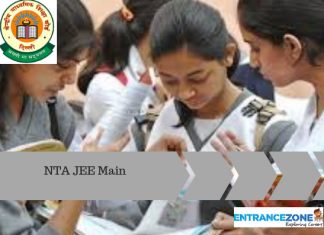 AP EAMCET 2019 is organized by Jawaharlal Nehru Technological University, Kakinada as Engineering, Agriculture and Medical Common Entrance Test (EAMCET). Furthermore, it is approved by Andhra Pradesh State Council of Higher Education (APSCHE). Also, a large number of candidates appear in AP EAMCET 2019 Exam to get a secure place in engineering and medical programs available in various colleges and universities designated under the state of Andhra Pradesh. Further, Andhra Pradesh EAMCET Exam will be held in the Fourth week of April 2019. Deadline to submit the Application Form with the fine will be the Third week of April 2019. Therefore, the interested applicants must apply within time to avoid a late fee. ap eamcet 2019 notification, ap eamcet 2019 application form date, ap eamcet 2019 weightage, ap eamcet 2019 date. Is there any age limit for EAMCET? What is the marking system in AP EAMCET 2019? In what languages will students be able to attempt AP EAMCET 2019? How many marks are required to qualify for AP EAMCET 2019 exam?